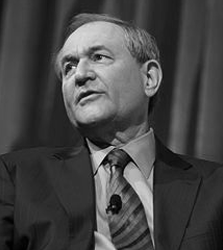 Jim Gilmore is the former governor of Virginia, elected to a single four-year term in 1997. (Virginia does not allow its governors to serve consecutive terms.) He also served as chairman of the Republican National Committee for one year, and ran unsuccessfully for the GOP presidential nomination in 2008. He officially announced his candidacy for the 2016 nomination in August of 2015. Gilmore ran for governor as a tax-cutting conservative and has been a voice for smaller government and free markets. He is also a former Army intelligence officer and has made the increasing international instability a cornerstone of his campaign. For the last several years he has been president of the Free Congress Foundation, a conservative think tank. He began his campaign hampered by low name recognition, something he has been largely unable to overcome in a crowded field filled with candidates with more recent credentials and accomplishments. After being invited to the first “undercard” debate for low-polling candidates, Gilmore failed to qualify for the next five events, only making the early state again for the late-January event. His relatively low-key demeanor and mediocre communications skills add to his challenges. Gilmore currently does not register any support in national polls or polls in the key early states, and his fundraising has been negligible – as of the end of December he had raised less than $200,000. He has failed to qualify to be on the ballot for most of the primaries and caucuses, and although Gilmore is known for his perseverance, it is unlikely he will be able to rise from the bottom to even make a noticeable impression on the 2016 Republican nominating contest. James Stuart “Jim” Gilmore III was born in Richmond, Va., on Oct. 6, 1949. His mother, Margaret Evelyn Kandle Gilmore, worked as a church secretary and his father, James Stuart Gilmore, Jr., was a grocery store meat cutter. After graduating from John Randolph Tucker Public High School in Richmond, he earned a B.A. from the University of Virginia in 1971. While there, Gilmore was a member of the College Republicans and the Jefferson Literary & Debating Society. Gilmore enlisted in the U.S. Army following his graduation from UVA and served in military intelligence. After leaving the Army in 1974, Gilmore attended law school at the University of Virginia, graduating in 1977. From there, he joined and became partner in the firm of Benedetti, Gilmore, Warthen and Dalton. In 1987 he won elected office for the first time as the Commonwealth’s attorney for Henrico County. He was re-elected to the post in 1991. In 1993 he was elected Virginia’s attorney general. He resigned as attorney general in 1997 to run for governor, beating the Democratic lieutenant governor by a margin of 56-43 percent. He was propelled to victory largely on two promises: (1) reducing and eliminating Virginia’s car tax, and (2) hiring 4,000 new public school teachers. While governor he chaired two congressional advisory commissions, one on electronic commerce and the other assessing the risk of a terrorist attack in the U.S. using weapons of mass destruction. He served as chairman of the Republican National Committee during the last year of his term as governor, resigning in January 2002 over disagreements with the George W. Bush administration. The Virginia Constitution prohibits governors from serving consecutive terms, so Gilmore was unable to stand for re-election in 2001. In January 2007, he announced his candidacy for president of the United States. In the face of low fundraising and poll numbers, Gilmore ended his campaign in July 2007, and later that year announced his candidacy for Virginia’s open U.S. Senate seat. He narrowly won the Republican nomination at the Virginia GOP Convention and went on to lose to Democrat Mark Warner in 2008 in a landslide, 65-34 percent. Gilmore’s defeat by more than 1.1 million votes was the most lopsided in a contested Virginia Senate race in 20 years. Following the loss in the Senate race, Gilmore became involved with several think tanks and public policy groups. He served as chairman of the National Council on Readiness and Preparedness (focused on homeland security), and as president of USA Secure, a D.C.-based homeland security think tank. Most recently, Gilmore served as President & CEO of the Free Congress Foundation. He is on the board of directors of the National Rifle Association. He has also been a regular commentator on Fox News Channel. Gilmore is married to Roxane Gatling Gilmore. Together they have two sons, Jay and Ashton. Throughout his time as governor, and his subsequent campaigns, Gilmore has remained largely consistent on most issues. He has served since 2009 as president of the Free Congress Foundation. Additionally, Gilmore served as chairman of two Congressional advisory commissions, one on electronic commerce and the other assessing the risk of a terrorist attack in the U.S. using weapons of mass destruction. Gilmore signed an executive order as governor directing state agencies to consider the impact of regulations on family stability, including their impact on family income.39 A 2001 article in The Washington Post makes observed that “Gilmore groans about excessive regulation”40 but there is little record that it was a focus of his governorship. Aside from opposing the bailout of Wall Street in 2008, Gilmore has said relatively little about corporate welfare. Gilmore supports the death penalty, “because it sets a standard that says that we will not tolerate these ghastly murders that not only kill people, but destroy families forever.”113 During Gilmore’s term as Virginia governor, 37 people were executed. Gilmore was criticized for his performance as Republican National Committee chairman, which ended with his resignation after one year (chairs normally serve a two-year term). He reportedly had a contentious relationship with the George W. Bush White House and was criticized for not being aggressive in promoting the president’s agenda.145 Republicans also lost two major gubernatorial elections in states where they had previously held the governor’s mansion, including Virginia. Gilmore has been largely absent from the national political scene since leaving the Virginia governor’s office and RNC chairmanship, aside from his brief presidential bid in 2007 and Senate election loss in 2008.